Nicole Cone joined our staff in November of 2011. Nicole has a background in auditing and finance. She manages the financial and administrative functions of St. Patrick’s church office. Nicole and her husband, Jonathan, began worshiping at St. Patrick’s in 2010. Nicole is available by email at [email protected] or by phone at 770-455-6523. Cowen Harter joined our staff in October 2017. Cowen is a trained educator who taught high school mathematics before stepping into school administration. She also served as Director of Accountability at the Georgia Department of Education as well as a Focus Schools Specialist for West Georgia RESA. Cowen and her family have been members of St. Patrick’s for more than 30 years. She may be reached by email at [email protected] or by phone at 770-455-6523. 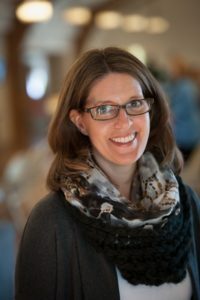 In 2010, Kelli graduated from Candler School of Theology at Emory University with a Master of Divinity degree, including a Certificate in Religious Education and a Certificate in Women in Theology and Ministry. She served as the Coordinator of Servanthood Ministries at Christ the King Lutheran Church in Norcross, as a team leader for Christian Formation at Epiphany Lutheran Church in Suwanee, and she has been worshipping at St. Patrick’s since January, 2017. Kelli has a heart for children’s ministry, for the vital role that children have in our faith community, and for the call of the church to nurture children and those who care for them by building communities that enfold them in grace, love, peace, joy, and compassion. Away from St. Patrick’s, she can be found homeschooling her daughter, pulling weeds in her garden, or paddling around the calm and peaceful waters of Lake Berkeley. She looks forward to welcoming you and your children into the vibrant life and ministry of St. Patrick’s! She may be reached by email at [email protected] or by phone at 770-455-6523. Liz Beal Kidd joined our staff in August of 2015. Liz is available by email at [email protected] or by phone at 770-455-6523. Nathan Medley juggles three careers as a music educator, international performing artist, and church music director. As a teacher, Nathan’s students have gone on to top colleges and conservatories, major world stages, and become notable recording artists. In recent years, he has been lauded as one of the leading younger-generation countertenors, with notable success internationally in concert and opera. Recent highlights include debuts with The Berlin Philharmonic under Sir Simon Rattle; San Francisco Symphony; London Symphony; Carnegie Hall; Los Angeles Philharmonic; English National Opera; Barbican, London; The Lucerne Festival; and the Concertgebouw, Amsterdam. Nathan grew up in Karachi, Pakistan as the son of Presbyterian Missionaries and continues his passion for Christ today. Prior to joining the team at St. Pat’s he held church music jobs at Bethesda-By-Bay Lutheran, Cleveland; Trinity Episcopal, Houston; Christ Church Cathedral, Indianapolis; and Our Lady of Peace, Columbus (OH). Nathan is a graduate of Oberlin Conservatory with degrees in Vocal Performance and Historical Performance Practice. He may be reached by email at [email protected] or by phone at 770-455-6523. Trey is delighted to be serving as our seminarian this school year. He is a second year M.Div student at Candler School of Theology at Emory University and is pursuing a concentration in theology and ethics but his academic interests also extend into the realm of international development and theological education. In his free time, he loves to read, play sports, and go to the movies. Some of his hopes this year include forming relationships with all of the St. Patrick’s community, developing a stronger sense of pastoral identity, and contributing his talents towards the St. Patrick’s expression of the body of Christ. Trey looks forward to jumping in with what God is already doing in our midst!